Rusted Tank in the snow at Whalers Bay on Deception Island in the South Shetland Islands archipelago. Deception Island, part of the South Shetland Islands group, is located off the Antarctic Peninsula. I was there as part of a photography tour I co-ran with David Burren. This post features quite straightforward documentary portrait photos as well as more artistic interpretations of the landscape surrounding the abandoned Whaling station at Port Foster on Deception Island. We sailed from Ushuaia, in Southern Argentina, on the Polar Pioneer, a Russian ice-breaker operated by the Australian tour company Aurora Expeditions. David Campbell photographed while exploring an old oil drum during a snowstorm at Port Foster by the shores of Whalers Bay on Deception Island, Antarctica. The above photo features tour participant, David Campbell, who had been photographing inside the interior of an old boiler at the abandoned Hektor Whaler Station during a snow storm. I remember entering the space to find shelter as much as through any need to explore what was inside this old shell. Since this trip David Campbell has gone on to travel to Spitsbergen in the Arctic, in search of polar bears, and to Alaska to photograph the Northern Lights. Photography tours are a blast. Sometimes that term can be used quite literally as this photo of Ken in a snowstorm on Deception Island, Antarctica illustrates. There were also more general tourists and, I think I'm right to say that, Ken and his wife, Jan, fell into that group. In the case of the photo of Ken I was as warm as toast. Clearly Ken wasn't, and that influenced the way I went about making the picture. He looked really cold and I just couldn't get past the fact that his glasses were covered in ice. That whole notion of the eyes being a window to the soul is such a beautiful concept that underpins the success of many great portraits. As much as anything else this picture is the antithesis of that concept. And that's one of the reasons why I made it. Being from South Eastern Australia I've grown up without the joys and hardships associated with living in a much colder part of the world. In particular I refer to long months living in a world covered by snow and ice. To experience snow I've had to travel considerable distances, usually to overseas destinations. As a result I still find photographing snow and ice to be a fairly unique experience. In fact I love it! The photo directly above, made looking out the window from an abandoned hut in Port Foster, Deception Island onto a bleak, snow-covered landscape is interesting to me. The exterior and quite desolate view of the landscape, during a heavy snowstorm. The interior landscape of the hut, which seems to offer only a bare minimum of protection against the harsh weather outside. A psychological landscape, which I like to refer to as a 'landscape of the mind'. David Burren in the ruins of a building at Port Foster on Deception Island in the South Shetland Island Group, Antarctica. 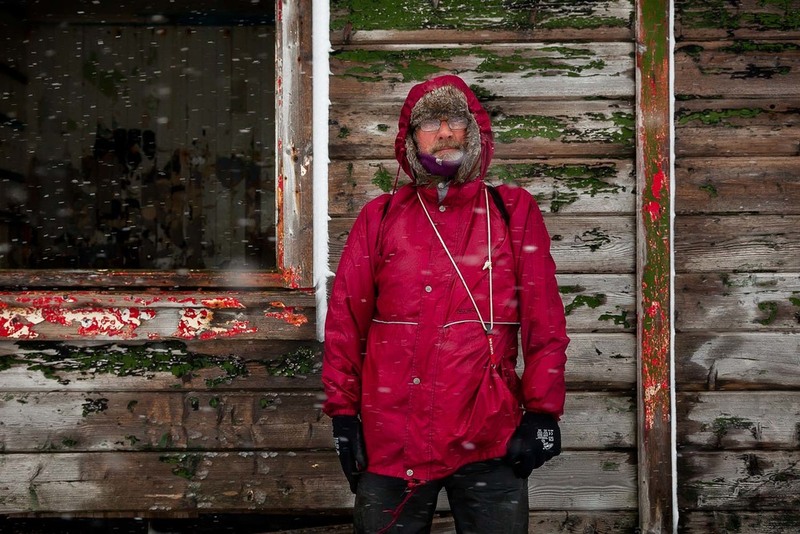 The photo of my friend and colleague David Burren was made under slightly cheerier conditions inside one of the ruined buildings at Fort Foster on Deception Island. Because the photo was made in more comfortable surroundings than those of David Campbell and Ken I was able to take a little longer making the picture. What’s more the light and, therefore, the colors within the scene were much more pleasing to work with. Ruins of a building at Port Foster on Deception Island, Antarctica. All three portraits were made, more for the guys I photographed than for me. We photographers often feature in too few photos so, where I can, I try to make some beautiful photos of my friends and peers. If the conditions are against me, then I’II settle for interesting photos. After all, they’re probably the ones that best describe the most memorable moments of a trip and bring the most enthusiastic comments from friends and family. There’s nothing wrong with making straight documentary images that record, for posterity, what we do, where we are and who we’re with. On one level, that’s our life and there’s no need for those photos to explore any deeper meanings, metaphors or messages. It's not the way I prefer to work or, for that matter, live. But it's okay every now and again. It's a record, sometimes a bit of a giggle and, frankly, a nice thing to do for other people. A group of old rusted oil drums at Port Foster on Deception Island, Antarctica. Photography, as art, isn’t so much about simply recording what we see in front of our camera’s lenses. Art is about intent, meaning and exploring what those subjects or scenes suggest about ourselves, the world in which we live and the Human Condition. It’s true that we may not always have a great deal of control over the scenes or subjects in front of our camera, the weather we find ourselves photographing under or, for that matter, what happens to us while we’re there. But what we make of those circumstances, events and interactions is what matters most. Such choices determine our reality, in the present and, as a consequence, in the future. Choice is a gift, and all great gifts come with responsibility and consequences. Do they not? Our lives are determined not so much by what happens to us, but by what we choose to make of what happens to us. Experience can be a useful thing in guiding us to make the right decision. But what we make out of what’s going on inside our own head, right now, is all that really matters. Because it’s that decision that determines how we feel, in this very moment, as well as what world we create for ourselves in the next.